S.F. is a haven for the Bohemian set, but have you been properly versed on living the lifestyle? Allow the ever-eclectic Anna Sui to school you. We sat down with the designing powerhouse this past weekend to talk everything from dressing rock-'n-roll royals to exploring untouched ends of the earth. With a new spritz-worthy fragrance gracing store shelves and some pretty awesome ventures ahead, Sui gave us the lowdown on how to truly embrace La Vie De Boheme. What was the inspiration behind your fragrance La Vie De Boheme, and what made you choose that lifestyle? "All of my fragrances come from part of my world. It's about the discovery of yourself and your world, but we never did anything that was inspired by fashion directly. I think when anybody talks about Anna Sui, they say, 'Oh yeah, she's a little bit girlie, a little bit rock 'n roll, but they also say that there's always a bohemian sort of feel — no matter how many times I try not to, it always reverts into that. So, I think it's really my style, and I love this global gypsy thing. I wanted to have a fragrance that had that same message. We are all global creatures now and we're not just influenced by one city, one state, one country; it's all global." How would you describe the bohemain girl? "I think she's usually very artistic, and very independent with a bit of defiance in her because she likes to do her thing her way. I relate to that because I've always done things my way, too. I think that there's also a very wandering sort of thing, where you're always trying to discover — that's always part of it." Where in your life journey did you pick up this bohemian aspect to your personality and to your designs? "I think that it's because my parents came from China to France, and they were both educated in Paris, then they came to the United States, so growing up I always heard, 'Oh, when we were in Switzerland, when we went to Italy, when we went to England...'" I was very open-minded about traveling and acquiring other cultures. I remember when I opened my first store in Los Angeles, I got a call from Franca Sozzani saying, 'You have to fly to Italy tomorrow because I have this job for you.' So, I jumped on a plane, went to Italy, and worked there for seven years on a freelance job. It worked out great and it opened up my mind to the fact that I could really go anywhere and work. Once I got offers to work in Japan, it was the same thing, I didn't know the language or the culture, but I went. And, that's what really opened up everything for me." What is the one place that has impacted you the most? "I love New York because that's where I live, I also love London — that seems to be where I keep going back to, even when I was working in Italy, every weekend I would go back to London. But, then I like to go to very exotic places too, like I traveled to Rajasthan. I like going to where you feel like it's untouched by anything, so recently I've been in Jakarta, which is amazing because they had the most amazing flea market there. This summer, I went Tanzania and that was just remarkable. There is nothing there — just the animals, the maasai, and the earth." All of your shows over the years have had such head-to-toe concepts. You look at them and understand what that girl is doing — how does that come about? "I have the best job in the world, because anything that I'm obsessed with, anything that I want to learn more about, I put it in my work and that gives me the opportunity to research it and obsess about it. The last collection from spring was inspired by the Pre-Raphaelite painters, and those are my favorite paintings, ever. I saw this incredible exhibition in London, and it was the first major exhibition of those painters since the '70s, and I just took it all in. I love the color palette, the fact that they were a brotherhood, and that they all had this theory of what the art should be. One of their favorite things were redheads, and they would scour London for the perfect redhead, and call her a stunner. So, that's why I had Karen Elson open my show, because there's not a more stunning redhead out there." You've dressed so many people, including Madonna. Who have been the most exciting people to dress? "The most exciting was my all-time idol Anita Pallenberg. I met her when she came to New York and she loved my clothes. The first men's customer I had was Mick Jagger...he was about to host Saturday Night Live at the time. The show called in the whole collection and bought four pieces from it. He wore an Edwardian-like suit that draped with a beaded vest. Marylin Manson was also fun, he came and looked at all the lookbooks when he did the MTV Awards. He had seen Naomi wearing chaps with no underwear, so that's where he got the idea to wear them. Courtney Love, she came in actually right after Kurt died, and she said, 'This is the first time I've been happy since that all happened.'" What gadgets can you not live without for work and beyond? "I never thought it would happen, but I sleep with my iPhone! That's the first thing I do when I wake up — it's so crazy — and lately that's all I travel with, too." "Shazam — how many times are you somewhere and you're like, 'What is that song?' And, I like a lot of the photo ones, the one's that make the photos prettier. Do you know Mika Ninagawa? She's got an app now and you take a picture and frame it with those flowers." What do you plan to do while in San Francisco? "My cousin lives in the Mission so he made reservations for us. I remember last time he took me to this really cool restaurant there called Beretta." 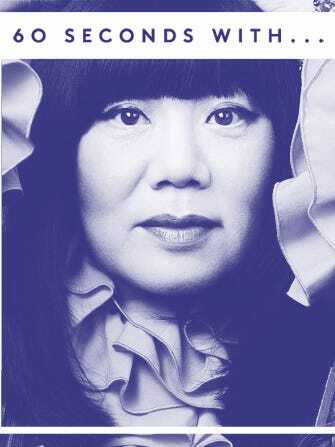 What is next for the Anna Sui empire? "I'm hoping that it will attract lifestyle licenses. I would love to design home goods, and I would love to do furniture. I'm about to launch a sports collection in China with Fila. I just saw the finished collection the other day, and I think that will be something really different for me. I'm going to London next week, because we are partnering with ASOS for cosmetics, so that's a big breakthrough for me."